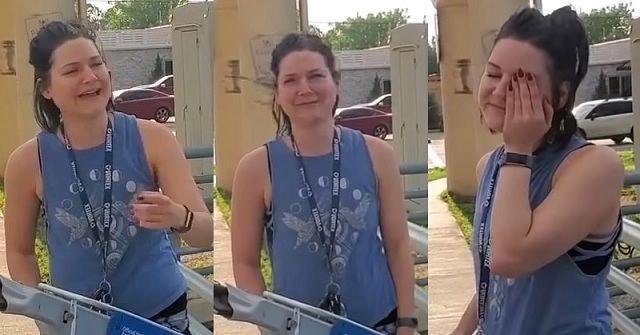 A Houston woman was literally shaking when she came across a group of people holding a sign reading, "It's OK to be white." In a video shot by Houston Infowars Army members Sunday, a bicyclist approaches the group asking why they're waving the banner. "It's not OK," she tells them. When one of the group members tells the woman it's OK to be any skin color, the leftist concedes, "Yes, it's OK to be white," but adds, "but you have not faced oppression." "It hurts my heart to see people do this," the woman claims as she starts hyperventilating. You gotta watch the video. She feigns outrage for over six minutes straight without making a single point. She seems to think saying "are you serious," "I can't believe you people," "it's not OK," and "oh my God" is an argument. When Jussie Smollett's hate hoax collapsed spectacularly a few weeks back, after being publicized incessantly by Hollywood celebrities and the mainstream media, the most penetrating take came from journalist Andy Ngo. "Jussie Smollett's hoax is symptomatic of America's illness," Ngo wrote--a combination he attributed to the rise of victimhood culture fueled in significant part by increasing group conflict. Ngo, an outstanding reporter, was on to something. But it's not an "illness" of America writ large; it's an affliction particular to white liberals. Call it ethnic sado-narcissism, a demonstration of self-love that perversely manifests itself as a desire to denigrate and punish the broader ethnic group to which one belongs. We saw it with Smollett, we saw it with the Covington high-school boys in their MAGA hats, and we see it--in black and white--in recent survey data. Several recent polls by nonpartisan organizations suggest that white liberals have a unique distaste for their own ethnic group. And this matters for all of us because data show that white liberals dominate the institutions--the media, Hollywood and academia--that do the most to shape our public narrative. In-group bias is a widely recognized phenomenon. In recent survey data, every group measured--from black conservatives to Asian-moderates--shows a significant, and unsurprising, in-group preference. Except for white liberals, who show significant out-group bias--meaning white liberals prefer nonwhites to whites. This is a dramatic outlier compared to all other groups and it's not just a product of liberal ideology, an artifact of some universal liberal empathy for "the other" or some equally fanciful observation that would flatter the sensibilities of liberal whites. Out-group bias is not shared by liberal Asians, Latinos or African Americans, all of whom have more typical in-group preferences. 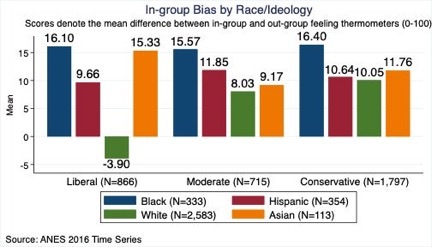 When looking at the GenForward data (all surveys were done confidentially online to minimize social desirability bias), whites of all ethnic groups had the lowest in-group bias, with moderates having a slightly higher bias than white conservatives. This would seem to counter the notion pushed by many on the Left that contemporary conservatism is some sort of stalking horse for white nationalism. Using the even larger American National Election Studies (ANES) dataset that includes voters of all ages, we observe the same phenomenon. African-Americans show the highest in-group bias independent of ideology. 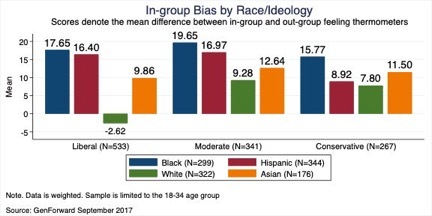 Hispanics and Asians are bunched in the middle, with no obvious ideological relationship between in-group bias and ideology. But apart from liberal whites, every group has a substantial in-group preference. In this respect, white liberals really are exceptional.